U.S. Cellular lands HTC Desire? 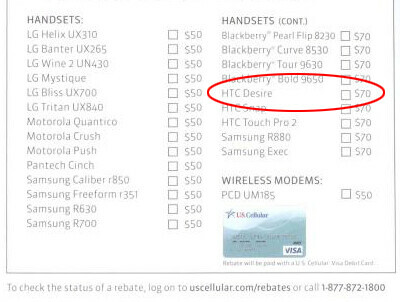 While no U.S. carrier has officially announced the HTC Desire, a leaked rebate form for U.S. Cellular shows the handset as one of the devices the operator will offer a rebate on. The nation's sixth largest carrier hasn't made any official proclamation about the Desire, but the rebate form says that customers must purchase their phone from April 16th to July 15th. With desirable specs like a 3.7 inch AMOLED WVGA display and the speed of the 1GHz Snapdragon processor, the HTC Desire will run Android 2.1 out of the box. Even if U.S. Cellular gets its hands on the Desire, that probably won't stop one or more of the four major U.S. carriers (Verizon, AT&T, Sprint and T-Mobile) from offering the handset. The phone is similar to the Nexus One with some additions like an optical trackpad, the inclusion of Sense UI, physical buttons, and 576MB of RAM.